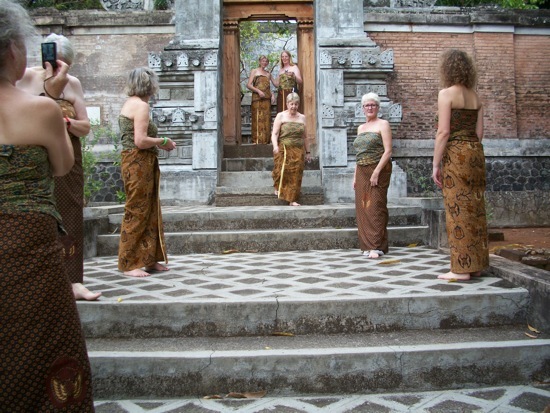 I am getting ready to lead a group of batik artists and lovers from Britain into the world of Javanese batik. In a few days time they will be here in Jogyakarta where I am now making my final preparations. Its something I have thought about doing for a long time, but I have been put off by the practicalities. How will soft European ladies react to the heat and humidity, the mosquitoes, the long flight, strange food, and the general poverty and degraded environment of Java? Of course if you are a fanatic about wonderful textiles, and batik in particular, then these things can be put up with – at least thats what I’m hoping. Anyway 11 brave souls (plus 2 even braver husbands!) have put their faith in me and will be the willing guinea pigs for my first Java tour, which begins on Monday. I have found a couple of great hotels with air conditioning, wifi, swimming pool and a recognisable breakfast, so we will all be comfortable. I have planned some great hands on workshops – one day making cap batik (with copper stamps) in Batik Winotosastro – one of the most famous batik factories in Jogya, a hand drawn batik workshop in the village of Giriloyo with the ladies who make batik for the court of Jogya, and a three day masterclass with Nia and Agus Ismoyo of the Brahma Tirta Sari studio. These will all unforgettable experiences I’m pretty sure! I’ve organised visits to canting makers, cap makers, and all manner of batik artists living in back street neighbourhoods where tourists never venture. 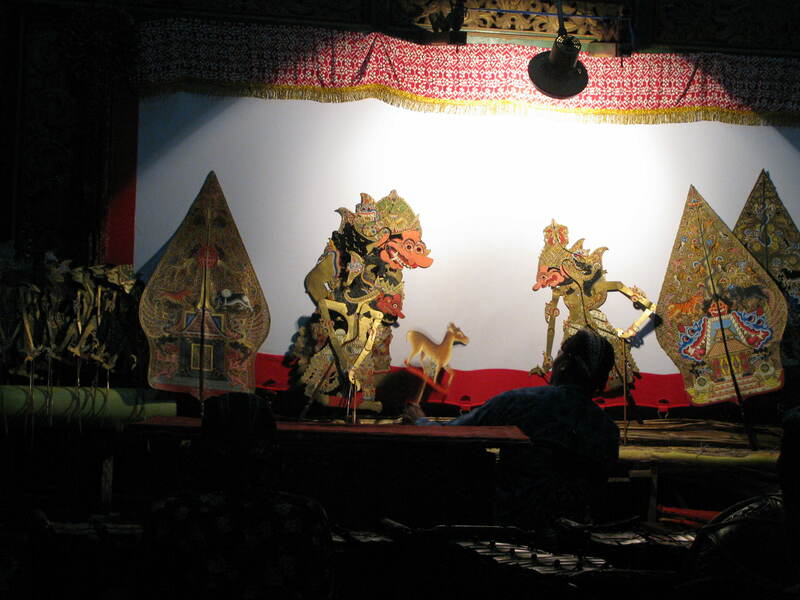 We’re going to visit the famous Danar Hadi batik museum in Solo, markets, factories, palaces, temples, villages set in rice fields, ancient Royal tombs, volcanoes, performances of wayang kulit – leather shadow puppets shows and the Ramayana ballet – honestly I couldn’t squeeze in more if I tried! Watch this space to find out how it all goes! Jim and I got off the plane in Jakarta and straight into the familiar sweaty heat and humidity of Java. Oh joy, we are literate. After the helpless incomprehension of written Thai, it’s amazing how good it feels to be able to read again. The smells are familiar too; the distinctive whiff of kretek clove cigarettes, verdant, damp vegetation, drains and poverty. We’re out of Jakarta as fast as we can make it, to Gambir Station to catch the train to Cirebon, about about 125 miles east. When the train arrives it has traditional batik designs painted down some of the carriages. Only in Java! 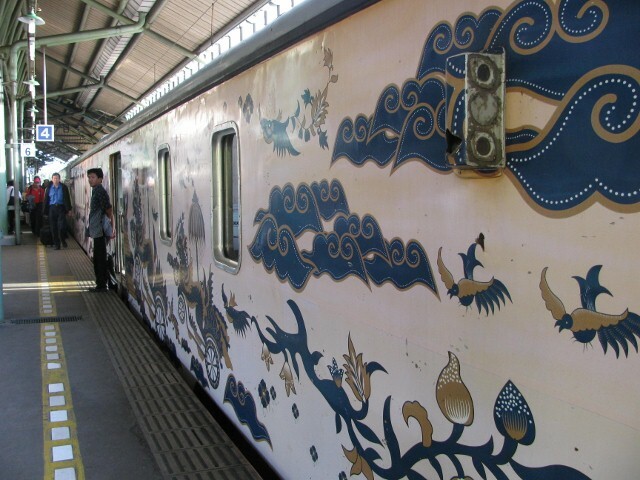 “Taman arum” another famous Cirebon batik design is painted on the train – a very superior form of grafitti! their little cycle carriages, too many beggars, shop assistants, ticket collectors, motorbike taxis, market sellers. 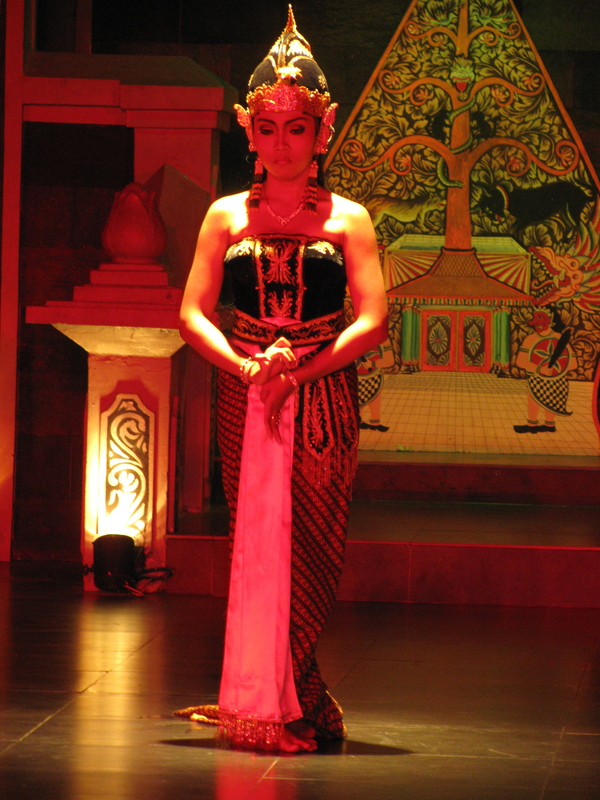 Java is just one of Indonesia’s 16,000 islands but it is the centre of Government, and culture in many ways. About the same size as Britain, it has 140 million living on it. As I said, there are just too many people! Cirebon doesn’t look any different from last time I was here, although maybe there are even more cars – the pavements are always blocked with stalls and warungs. A warung is what might charitably be called a “pop up restaurant” great if you fancy sitting on a grimy mat or bench under a dingy 20 watt light bulb eating some questionable food which was made this morning and has had a day’s worth of flies settling on it. Still not everyone in the world has any better options. We are here for the batik. 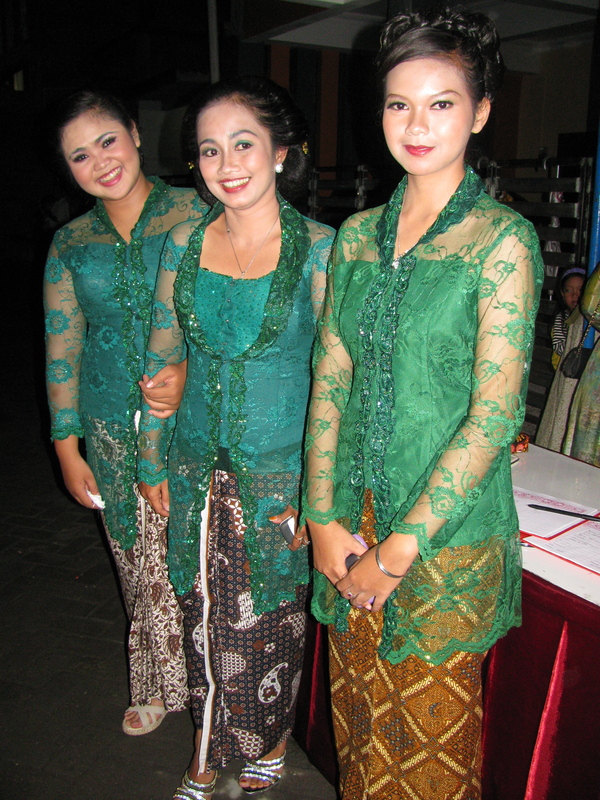 Cirebon is famous for its its own distinctive style – “Batik Ceribonan”. 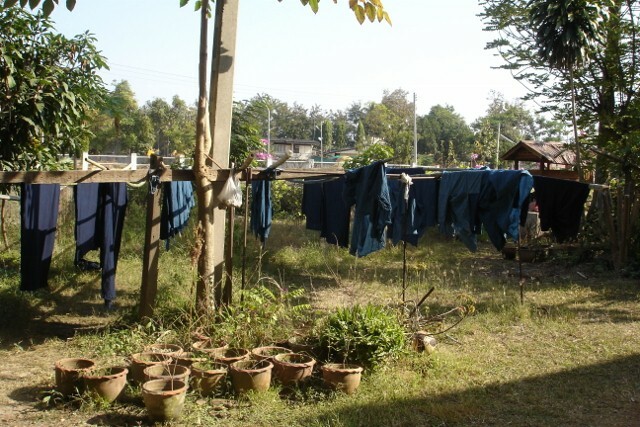 Most of it is made at a village called Trusmi, a few miles out of town accessible by bashed and beaten up old minibus. You climb in the back, peer down through the filthy waist height windows and try to make some sort of a guess at where you want to get off and then pay the driver an absurdly small sum of money. Up a narrow “main street” we squeeze through market stalls, school children (in batik school uniforms!) becaks full of women and their market shopping or empty and their drivers looking for a fare, motorbikes, reversing minibuses, piles of rubbish or building materials and mobile food carts. Eventually we reach the batik shops. Every type of customer is catered for here. There are bargain basement shops selling shirts for men and shapeless housecoats for women in cheap, imitation batik print, and there are smart air- conditioned salons with VISA signs on the door. These establishments cater for women with elaborate hair dos who emerge from cars with dark windows (so they can more easily ignore the filth) who are looking for something nice to wear for lunch with the minister’s cousin’s wife. Their drivers wait patiently outside. 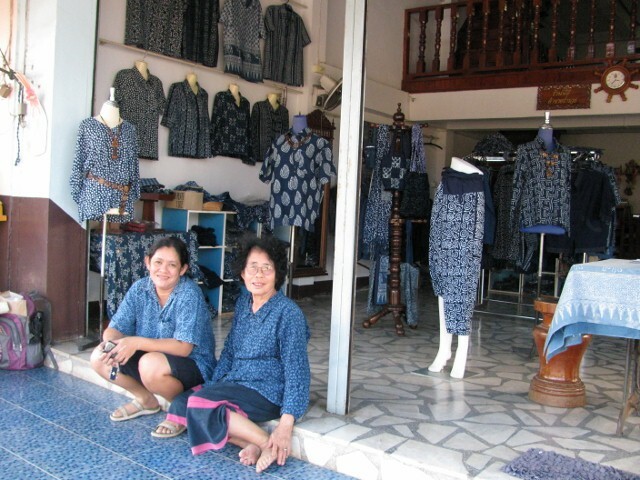 Although a lot of it is printed imitation, there is real hand made batik on sale here in Trusmi. The prices start at a couple of quid and go up to 5 million rupiah or more – enough to rent you a decent house for a year. 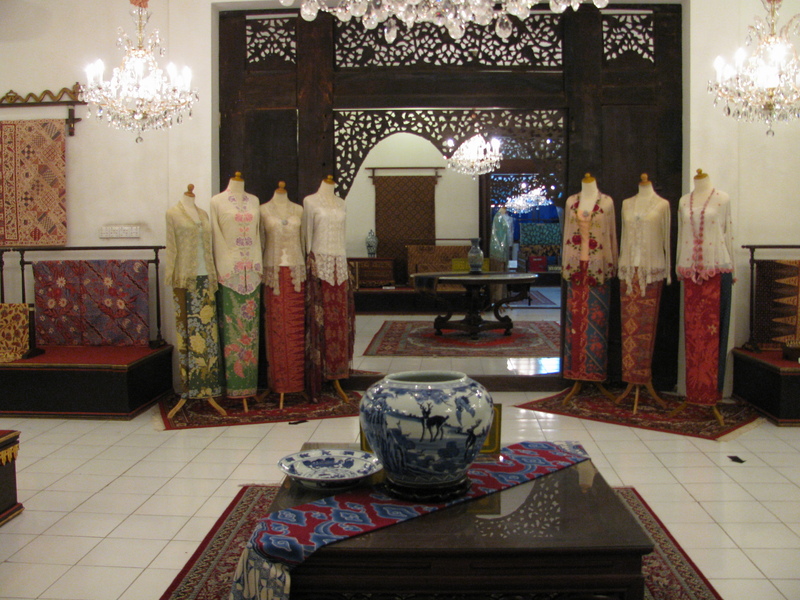 We want some silk batik scarves for the shop and some cloths in a famous Cirebon design – Megamendung. This evocatively named pattern, it means “storm clouds”, came from China. You will have seen it on Chinese embroideries or ceramics – it’s even on a pattern we are all familiar with – the “willow pattern”. Chinese traders have been coming to this northern coast of Java for centuries, along with Arab merchants and later Dutch soldiers, traders from the East India Company, colonisers and settlers. 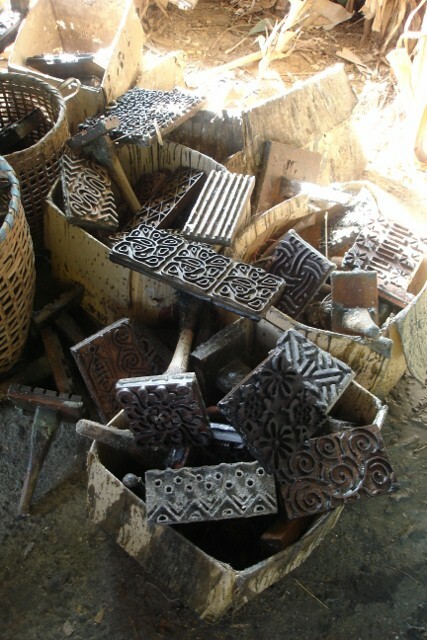 All of them have left their mark and a study of the batik textiles from these parts is a veritable history lesson. 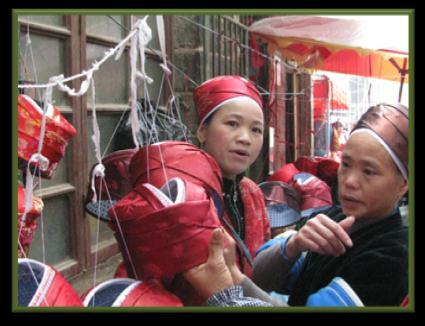 The Chinese are still here – many generations later they still keep to their own traditions. 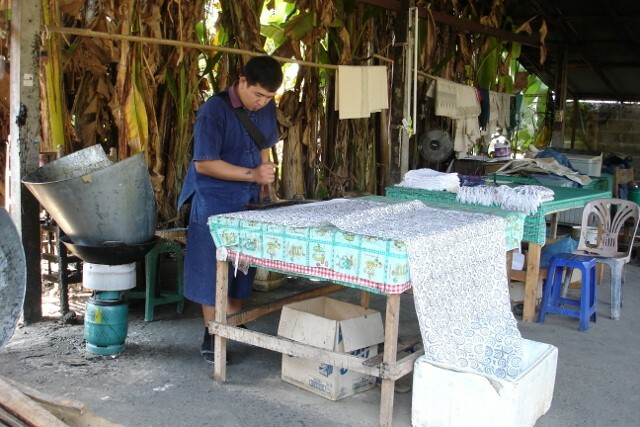 Being the enterprising sort of folk they are, some of them started up their own batik workshops. 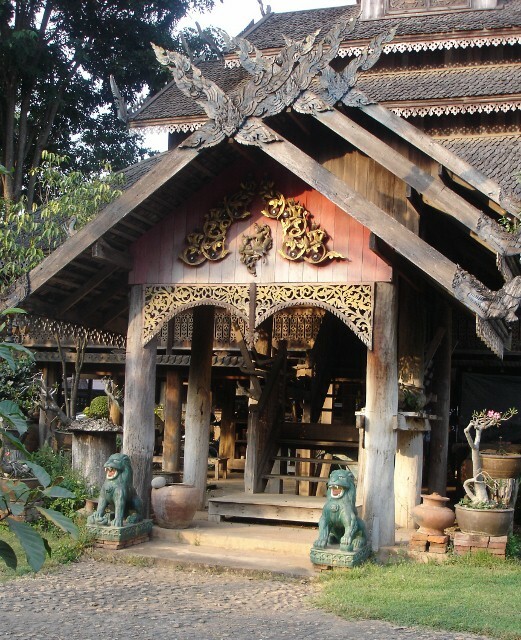 We met the present owner of one of these workshops – “Lina’s Batik”, the first time we came to Cirebon in 1986. She and her sister ran a sort of Chinese community centre here complete with a school to teach the children to read and write Chinese characters. Ibu showed me the certificate dated 1927, which her grandfather gained from the Sultan giving his permission to produce batik . 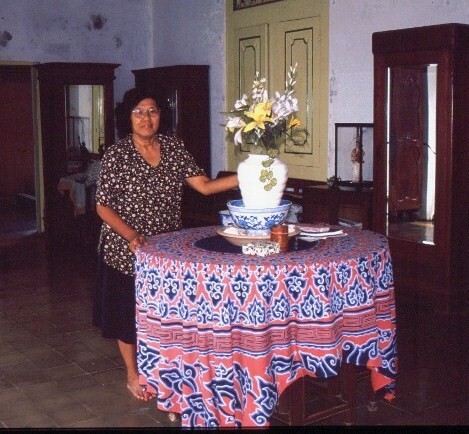 Lina, a 5th generation batik maker with one of her wonderful batik tablecloths. Lina’s now sells mainly to big stores in Jakarta, but they still make batiked altar cloths for the Chinese neighbours to buy at New Year, and the long cloths used to carry babies embellished with dragons and double happiness symbols. 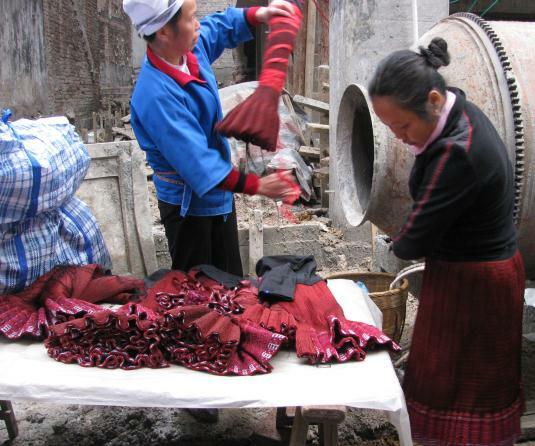 They also make beautiful megamendung cloths in the traditional colours; red, blue and white. One year I came to the workshop just as two pieces were being finished. 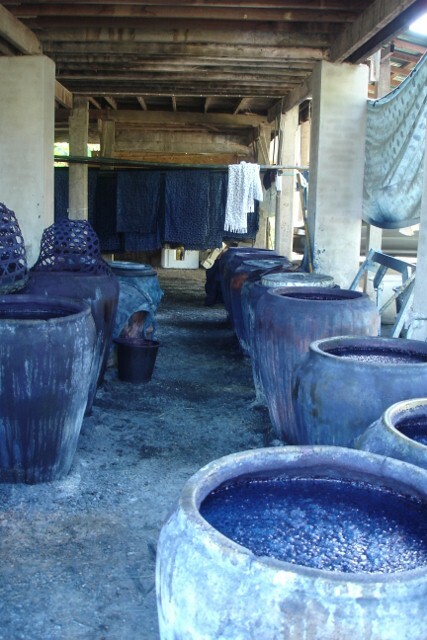 They were dyed in a red dye made from the roots of the mengkudu tree (morinda citrifolia) and a blue dye made from indigo. I swallowed hard when I heard the price, and bought one of them – now I wish I’d bought them both. Heri outlines the storm clouds pattern in wax. The first stage of the process. 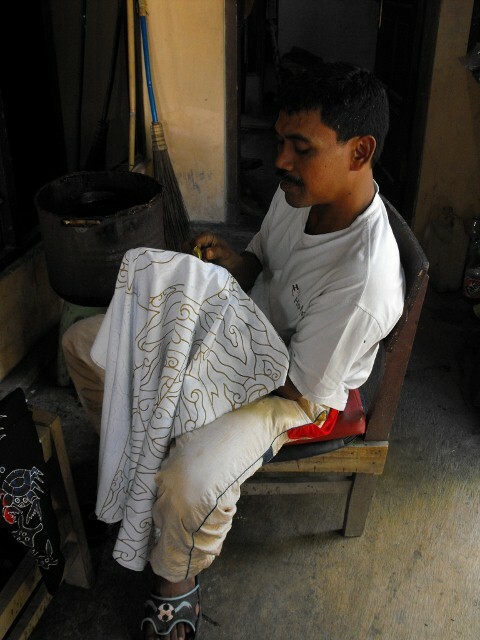 To make a perfect megamendung cloth, the parts which will be white and blue are first outlined and then filled in with a thick, strong wax. The cloth is dyed a deep rich red colour. If the dyes are chemical, then this is a quick process taking just a few minutes. 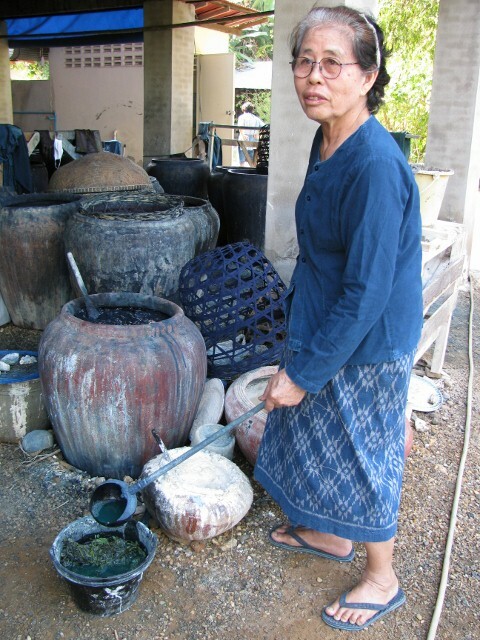 If they are plant dyes – or rather the “mengkudu” root dye, then this is a much more lengthy process. The cloth will be dipped and dried up to a dozen times. Then that thick layer of wax is removed in very hot water and the next waxing process starts. First the red parts and the white parts are protected with wax and the cloth is dyed pale blue (chemical or natural indigo) and the blue layers are built up gradually in this way from the palest blue to the darkest. The more layers there are, the more times the cloth has to be waxed and dyed, and the more expensive it is. Mine has seven layers. Finally all the wax is boiled out and the cloth is finished. No wonder they don’t make more than a couple a year. 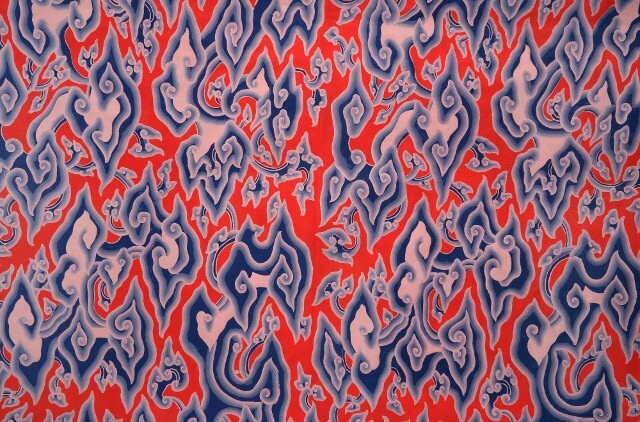 The blue clouds seem to float and hover above the red background, and all in all its one of my favourite batik cloths ever. Megamendung designs have been adopted by Cirebon and you can see them on street signs, wallpaper, school uniforms and, of course the trains. 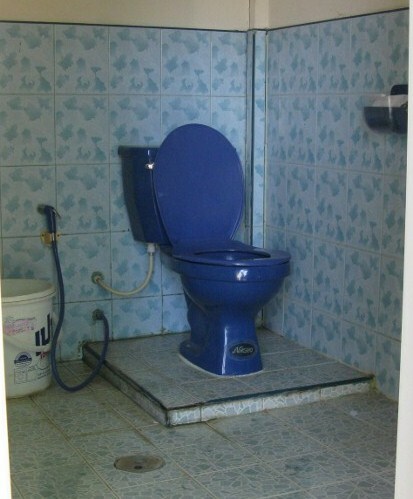 There was absolute outrage when it was reported that the perfidious Malaysian were trying to get it patented as one of their own National designs. 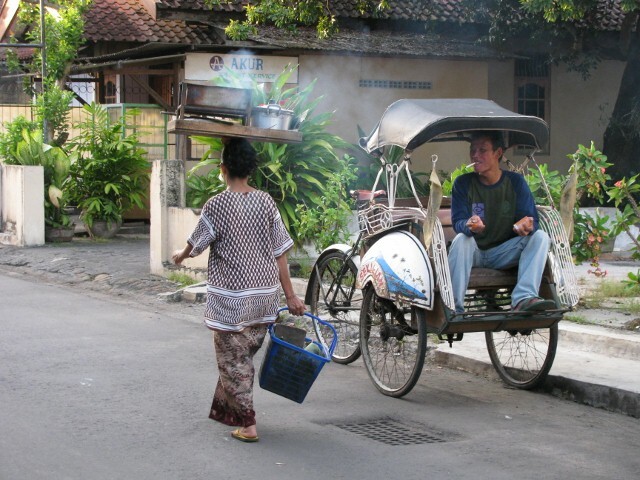 Children in Java have a very rich street life! Anyway back to Trusmi where we have spent a day reminding ourselves how to speak Indonesian, buying, bargaining and laughing with the sales girls in various shops. Just before we are ready to go home, the rain starts. Not just a drizzle or even a downpour but a deluge which forces us to stay for another half hour in the shop where we’re trapped. The road fills with mud brown water, the motorbikes come to a standstill, and soon the kids come out to cavort around and soak themselves. Welcome to Java! We may be appalled at the poverty, the degraded environment that people live amongst, the overcrowded streets and the level of hassle but I have a feeling that it won’t be too long before we are hopelessly in love with it all over again. We are here in Guizhou which is apparently the poorest province in China, and “without 3 acres of flat land, 3 days of good weather or 3 yuan to rub together”. Hmmm… well as with most things in China, things are never as you expect. For a start Kaili was supposed to be a “sleepy little town” – as far as I know there is nowhere on earth where the amount of building sites and sky scrapers on view here could possibly constitute a “sleepy little town”! Just like everywhere else we’ve been in this country, billions of yuan are being spent on co nstruction. The “old town” is being repaved, restored and made into one hell of a mess while all around and below people shop in the markets and go about their business. Wheelbarrows full of bricks are hoisted aloft while babies sleep and toddlers play below, sellers set up stall amongst the cement mixers and shoppers dodge the loose pavement slabs and potholes. On the southern edge of Kaili City, a whole new town is being built and on local TV and advertising hoardings, there are exhortations to invest in property. Communism is Dead! Long Live Capitalism! The restrictions have finally come off and just as in everything else, the Chinese are going full tilt. 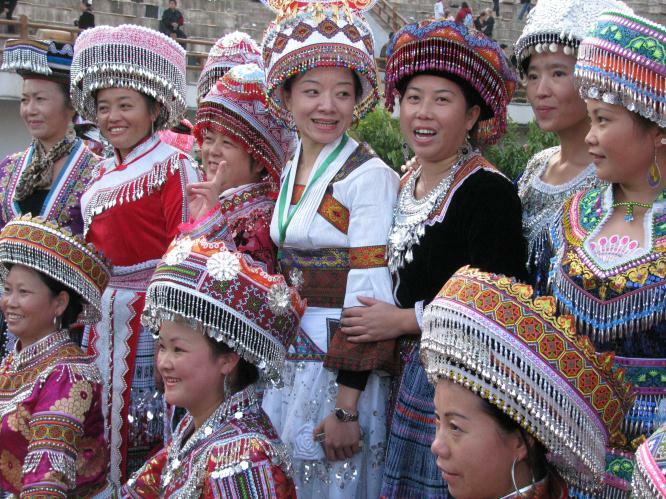 In China, the Han are about 92% of the population and the other 8% are called the “minorities” – we’ve already been through the Uyghur and Tibetan minority regions and now we’re in amongst the “hill-tribes”. 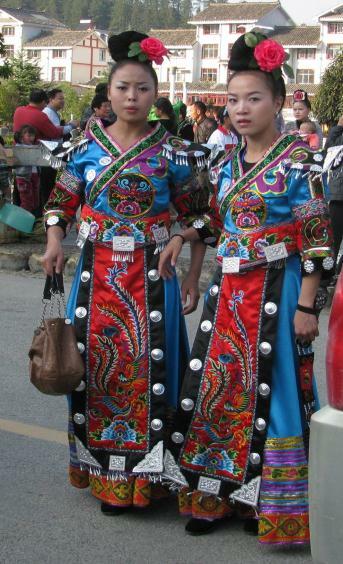 Around Kaili, about 80% of the population belong to a minority group – mostly Miao or Dong. To the untrained eye the minority people here seem more integrated into the mainstream, at least in the towns and cities. 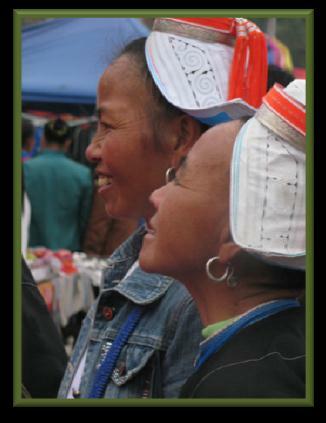 In many cases it’s the women’s head gear or hairstyles which give them away – strange little bonnets, squares of deep blue cotton, fringed hand towels, polished red turbans, and especially bunnage of various descriptions usually augmented by artificial roses, plastic combs, vicious looking silver chopsticks, metal wire hair pins and what have you.. But more often than not hill tribe folk are indistinguishable from anybody else. There seems to be a propensity for inappropriate leather shorts (the young and not so young women) and elaborately styled and dyed “emo” haircuts (the young men) but that may just be the fashion everywhere! But clan costume is still very important around these parts and it’s something not easy for us to relate to – but imagine if everyone from Scotland still wore their own tartan no matter where they were, especially on high days and holidays (Burns Night, New Year’s Eve, Bank Holiday pissups etc.) They would quickly recognise anyone else from their Clan whether they were in Edinburgh, London or Sydney. 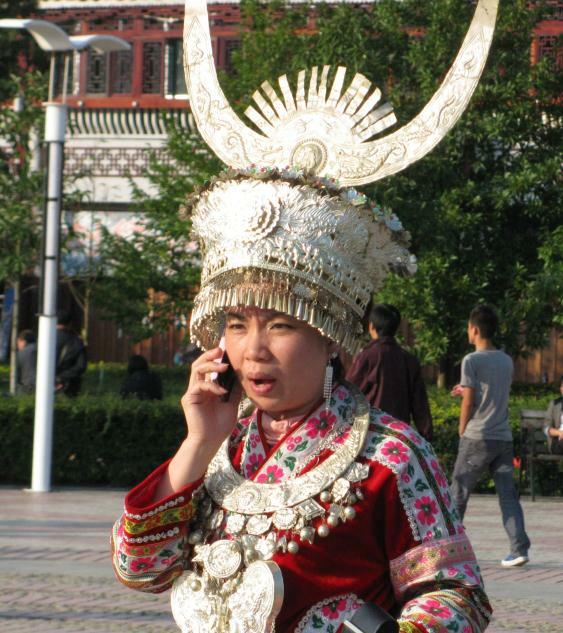 It’s just the same when the various tribal people here get into their gear –they are instantly recognisable. 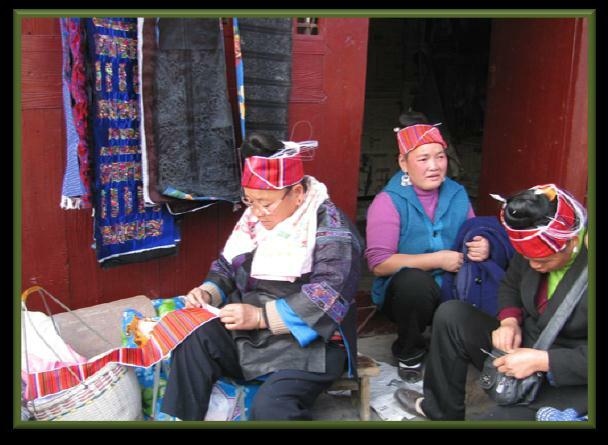 But that’s not the end of it – there are numerous sub branches of each nationality – and this is especially true of the Miao. 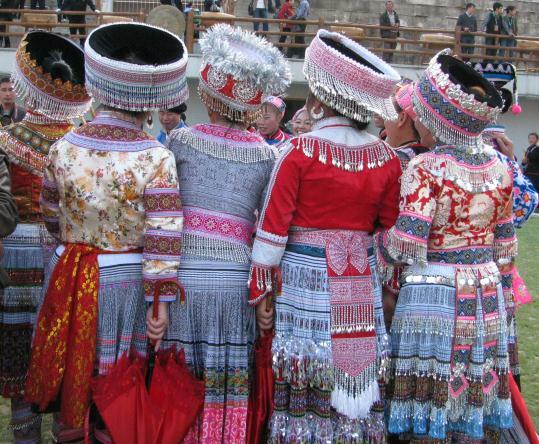 For example in South East Guizhou there are 37 different Miao groups – and they each have their own dialect and costume. If this was South west Shropshire there would be the Clun Clan, the Bishop’s Castle Brigade, the Mainstone Posse, the Brockton Lot, the Chirbury Crew and so on (feel free to substitute your own local villages here) and we would all be able to distinguish each other by our different accents and our very different costumes. We women would spend most of our spare time getting these amazing costumes together for our village “dos” (Michaelmas Fair, Green Man day, Carnival, the Village Show or whatever) because we’d need a new one every year. I suppose that just like here, folk from off would travel for miles to see our ceremonies and take photos, write books and make documentaries about us. The young people would be very happy to get out and go into the big city (Shrewsbury!) for their education, a job or some entertainment and the old folk would be terrified to leave the village –couldn’t read the writing and wouldn’t know where to get the bus back. But even more so than in the UK, things are changing at a rapid pace. 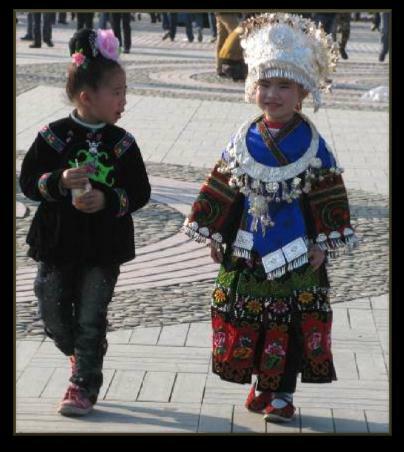 Not so long ago, at the time of the Cultural Revolution, all minority culture was severely suppressed and ceremonies and ethnic costumes were made illegal. Even the remotest villages had their Party members who made sure that the latest edicts on “eliminating the old ways” were adhered to. That changed in 1980 and since then there has been a total turn around in minority consciousness. Gradually the old traditions, dress and ceremonies have become re-established, and nowadays they are positively encouraged. 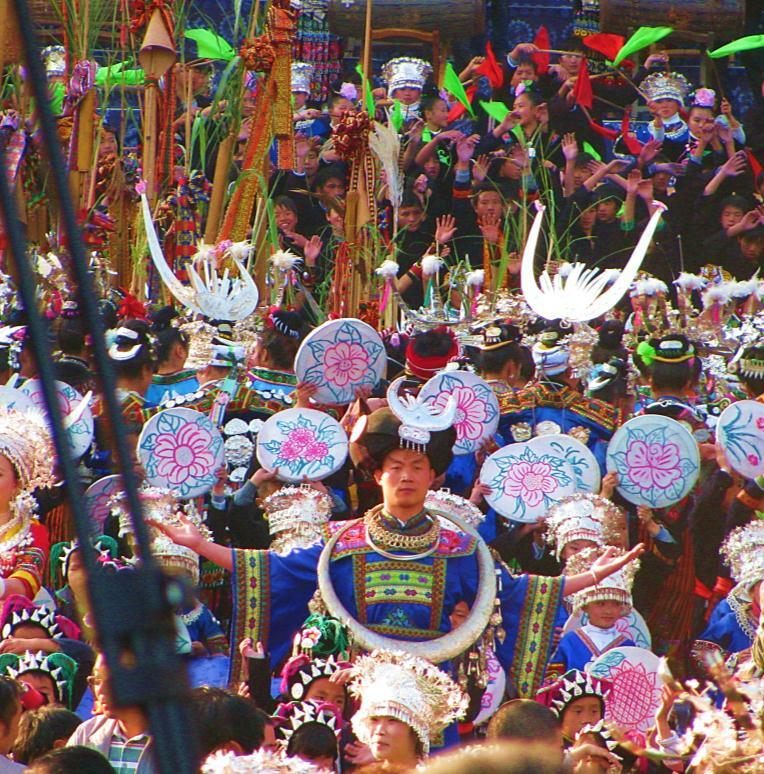 “Minority tourism” is big business these days and money is being poured into rebuilding traditional village structures like the drum towers and the covered “wind and rain” bridges, not forgetting the open performance area. Here tourist groups are treated to daily music and dancing shows from the lovely tribal girls all dressed up in their finery. About 20 years ago, all the villages got electricity and this led to television being available. Then all the villages had to get themselves a road and if that couldn’t be achieved, they had to move nearer to the road and this led to motorbikes and easier access to transport. Then there were mobile phones and the internet and now there’s mass tourism and the expressway. 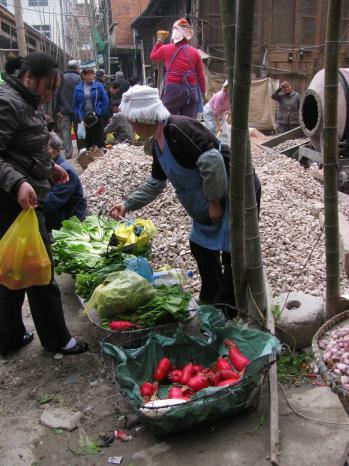 But whatever the changes, the amazing ethnic mix of south-western China is still a joy. 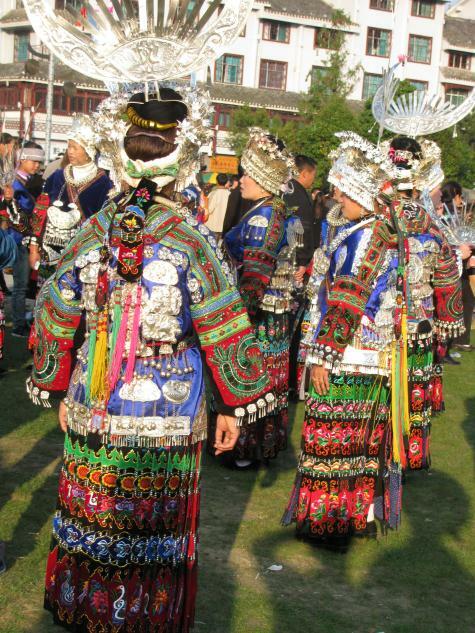 The splendid costumes and the techniques and the incredible skills used to make them are just gobsmacking. 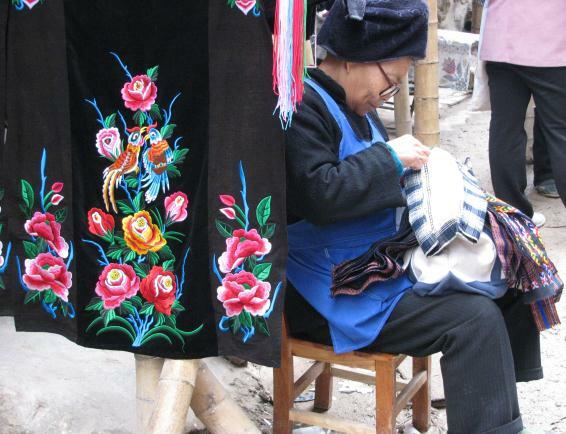 It would take a couple of lifetimes just to understand all the traditional textile techniques of this province alone. So I am just going to let it all wash over me and see what sticks. 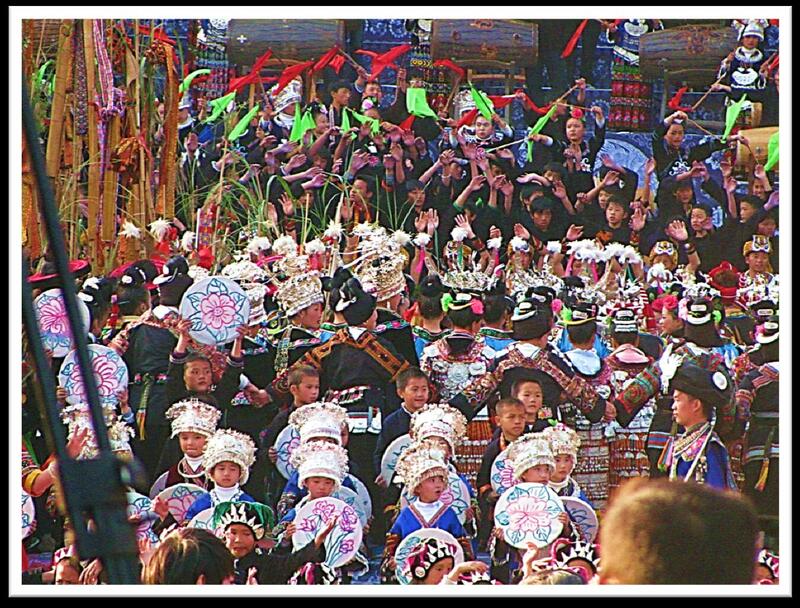 That said, we arrived just in time to see a huge Miao New Year ceremony involving six or seven different groups in highly impressive full regalia. Almost all those costumes relied heavily on machine embroidery and there are plenty on sale in the shops. But the good thing about not having to embroider a new costume every year is that you have more time to devote to your cross stitch kit!